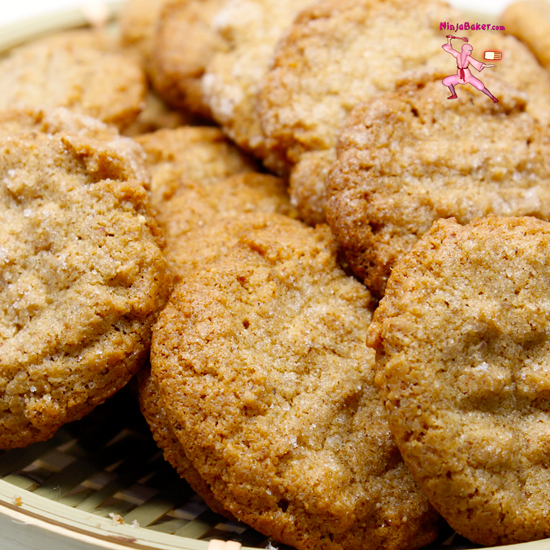 This recipe is adapted from a peanut butter cookies recipe at That Skinny Chick Can Bake . In one bowl, whisk together the flour, baking soda, baking powder and salt. Set aside. Whip up the butter in a kitchen stand mixer with the paddle attachment. Scoop the almond butter into the bowl with the butter. Beat until combined. Add the sugars and keep the paddle whirring for another 5 minutes. Scrape the bowl (and scrape often as you mix in the other ingredients.) Beat in the eggs one at a time. Stir in the vanilla. Slowly incorporate in the dry ingredients. Chill for two hours or overnight in the refrigerator. Let the dough warm up a few minutes and spoon up tablespoonfuls of almond butter cookie dough. (A mini ice cream scoop does the job perfectly.) Roll the cookie dough balls in the extra sugar. Place on parchment lined cookie sheets. Dip a fork into sugar and flatten the dough balls with a criss-cross design. Or simply flatten the balls with a small glass dipped in sugar. Chill for another two hours or overnight (to avoid excessive spreading while in the oven.) Bake in a 350 degrees oven for 12 minutes or until the edges turn a lovely golden brown.